Many books have been written about the Bible, but few explain its origins. This updated volume of the original classic provides a fascinating overview of how the Bible was first inspired, canonized, read as sacred literature, copied in ancient Hebrew and Greek manuscripts, and eventually translated into the languages of the world. This updated book will describe the development of many translations into contemporary English, giving readers a thorough guide to the differences between them. 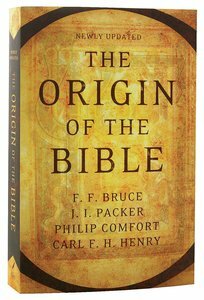 About "The Origin of the Bible"
Philip W. Comfort (PhD. in Theology from Fairfax University, D. Litt.et Phil in Literary Studies from the University of South Africa) has taught classes at a number of colleges, including Wheaton College, Trinity Episcopal Seminary, Columbia International University, and Coastal Carolina University. He is currently senior editor of Bible reference at Tyndale and served as New Testament editor for the New Living Translation. He has contributed a number of books to the Tyndale collection, both as author and editor. Among these are The New Greek-English Interlinear New Testament, The Origin of the Bible, The Tyndale Bible Dictionary, Essential Guide to Bible Versions, The Text of the Earliest New Testament Greek Manuscripts (with D. Barrett), Who's Who in Christian History--and recently Philippians, 1 and 2 Thessalonians, 1 John in the Cornerstone Biblical Commentary and The Many Gospels of Jesus with Jason Driesbach.